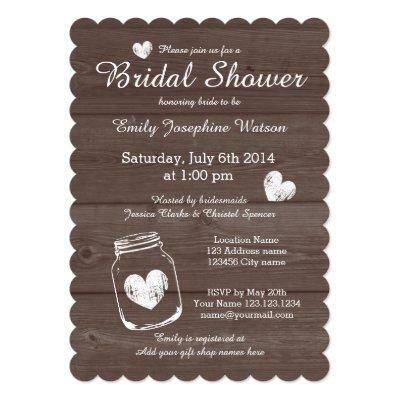 Elegant brown and white glass mason jar bridal shower invitations. Custom outdoors / barn wedding party invites with cute faded hearts. Customize scallop cutout shape. Beautiful stylish script typography text with vintage love symbols. Rustic country chic theme with wood grain panel background. Wooden pattern design.